Press release: Oxford, 5th October 2017 – Lendahand Ethex Ltd today announced the launch of Energise Africa – a new initiative enabling eligible UK investors to invest in pioneering businesses that install life-changing solar systems in homes in Sub Saharan Africa – bringing clean energy and economic opportunities to families, whilst aiming to generate up to a 6% annual return for investors. Investors will also be able to benefit from tax free returns by holding their Energise Africa solar investments within an Innovative Finance ISA. Capital is at risk and returns are not guaranteed. Currently 600 million people in Sub-Saharan Africa do not have access to electricity which limits their chance of achieving economic prosperity and improving quality of life. Energise Africa’s pioneering solar businesses are installing life-changing solar systems in homes in Sub-Saharan Africa – bringing affordable clean energy and potential economic opportunities to thousands of families. Over a 1 to 2-year period families can make regular monthly payments after which they own the solar home systems outright and are then able to realise further valuable cost savings. “We are delighted to be working with these great partners to support the development of this platform. Energise Africa addresses one of the key challenges in the off-grid energy space - access to debt. This project will have significant impact in delivering improved energy access, and therefore improved livelihoods, to many families in sub-Saharan Africa.” - Rosanne Gray, Managing Director of Virgin Unite. Energise Africa makes it simple and straight forward for eligible retail investors through to more experienced investors to invest in solar businesses that can deliver a clear social, environmental and financial return. Supported by UK aid from the Department for International Development and Virgin Unite, the non-profit foundation of the Virgin Group, the main objective of Energise Africa is to accelerate progress towards the achievement of the UN agreed Global Goal 7 – universal access to affordable, reliable, sustainable and modern energy for all by 2030. At the current rate of development this won’t be achieved until 2080 in Sub-Saharan Africa. 1) Choose a solar project to lend money to. Investors will be lending money to solar businesses working with Energise Africa. Some projects will also benefit from match funding and these are clearly indicated. 2) Lend money to a business. People can invest as little as £50 in solar businesses, alongside other investors. Once the project is fully funded the money is transferred to the solar business and the interest on the investment starts building. The businesses are able to purchase the solar home systems and start to distribute them to families in rural areas. Investors can monitor the status and impact of their investment by regularly accessing their wallet. 3) New opportunities are created for African families. The loans provided to the solar businesses are then used to purchase solar home systems which are then provided to African families with an affordable “Pay-as-you-Go” financing plan. Typically, families make monthly payments over a period of 12 – 24 months (depending on the size of the solar system) and then the family owns it outright once all payments have been made. 4) Investors get their money back. Every six months investors will receive both interest and a capital repayment from their chosen business. These funds can either be repaid or can be reinvested in a new project. 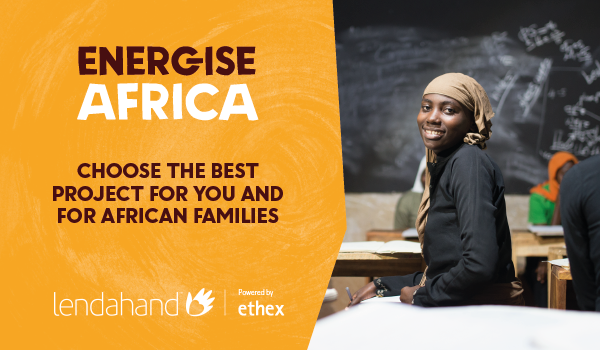 Investing in Energise Africa projects via the Lendahand.co.uk site involves risk, including the loss of all of your invested capital, illiquidity (the inability to sell assets quickly or without substantial loss in value), and it should be done only as part of a diversified portfolio. The investment opportunities on Lendahand.co.uk are not an offer to the public in any jurisdiction and are available only to registered members of the platform who have certified that they are eligible to invest. Any person who is not resident in the United Kingdom who wishes to view these investment opportunities must first satisfy themselves that they are eligible to do so under the securities laws and regulations applicable to them. This site does not constitute an offer of, or the solicitation of an offer to buy or subscribe for, any securities to any person in any jurisdiction to whom or in which such offer or solicitation would be unlawful. In respect of its regulated activities, Lendahand Ethex Ltd is an appointed representative of Share In Limited, which is authorised and regulated by the Financial Conduct Authority (FRN 603332).